I ran into Charlie’s compost by accident and found that a lot of people that like it. Since it is made in Kentucky and I live there, I decided to have a better look at it before I would write a Charlie’s compost review. These ingredients are composted between 8 and 12 weeks. This is the amount of time to finish the composting process. It is air dried and turned several times for a better composting. This is not your average NPK product since it does not contain a lot of these ingredients, but here are the numbers. It contains beneficial microbes that the plants need more. A plant needs about 52 different micro and macro nutrients. People focus too much on NPK. There is 10 LB in the bag and the bag measures 12.4 x 7.6 x 3.9 inches. This is not an easy to answer question since it depends on how good or bad your soil is. But there are some general rules on how to use compost. Best is to add about 4 inches of compost before the plating season starts. This gives it time to start doing its job by improving the overall quality of the soil. In this case a 1 or 2 inch layer should be sufficient to do the job of making your soil ready for the plants or vegetables. Some people mentioned in their lower ratings that it looked light colored and did not smell. This is normal with compost based on chicken manure and does not mean it does not work. Another mentioned that it did not work, because there was too much bark in the bag. Could be right but results are depending on the start quality of your soil. Overall the opinion is that is a very good compost and works great. 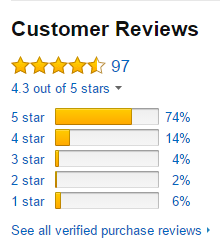 <<== Click on the picture to Read all customer reviews! Overall the Charlie’s compost get great recommendations from many gardeners that have use it sometimes for a long period of time with great results. Since this is a nature product there is however no guarantee and it depends on the quality or your soil you star out with. We can not tell if this is 100% organic compost. The manufacturer stated that they use their own chicken manure and combine it with local sourced organic materials. We have read enough customer ratings and opinions to give this Charlies compost a thumbs up and rate is as a good buy. Be careful not to use too much it seems that this compost is very strong and can burn your young plants. You might still have to add some NPK to your soil although it is sometimes hard to find some organic soil improvement products. Buy the 25 Lb bag and safe a lot of money. Read all our garden product reviews here.